I recently bought a new MacBook Pro Retina and unfortunately the built-in VPN client (Cisco IPsec configuration) doesn't work. Whats interesting third party VPN Tracker 8 works. I'm running Mac OS X is Yosemite 10.10.3. May 17 21:31:44 MacBook-Pro-Marcin.local racoon: IKE Packet: transmit success. (Information message). May 17 21:31:44 MacBook-Pro-Marcin.local racoon: IKEv1 Information-Notice: transmit success. (R-U-THERE? ACK). May 17 21:31:44 MacBook-Pro-Marcin.local racoon: IKE Packet: receive success. (Information message). May 17 21:32:14 MacBook-Pro-Marcin.local racoon: IKE Packet: transmit success. (Information message). May 17 21:32:14 MacBook-Pro-Marcin.local racoon: IKEv1 Information-Notice: transmit success. (R-U-THERE? ACK). May 17 21:32:14 MacBook-Pro-Marcin.local racoon: IKE Packet: receive success. (Information message). May 17 21:32:14 MacBook-Pro-Marcin.local racoon: IPSec Phase 2 started (Initiated by me). May 17 21:32:14 MacBook-Pro-Marcin.local racoon: IKE Packet: transmit success. (Initiator, Quick-Mode message 1). May 17 21:32:14 MacBook-Pro-Marcin.local racoon: Fatal NO-PROPOSAL-CHOSEN notify messsage, Phase 1 should be deleted. May 17 21:32:14 MacBook-Pro-Marcin.local racoon: Message: ''. May 17 21:32:17 MacBook-Pro-Marcin.local racoon: IKE Packet: transmit success. (Phase 2 Retransmit). May 17 21:32:42 MacBook-Pro-Marcin.local racoon: IKE Packet: transmit success. (Information message). May 17 21:32:42 MacBook-Pro-Marcin.local racoon: IKEv1 Information-Notice: transmit success. (R-U-THERE? ACK). /* -ipconfig with VPN Tracker 8. VPN work great. /* -ipconfig with Apple built-in VPN client. VPN does not work. Your problem might be a basic MacOS X network configuration one. Most probably if you are using the infamous Automatic network configuration. So as to clarify this point could you please make two ifconfig -a. One when your working VPN is built with VPN Tracker 8. I found solution. It's working now. I changed my DNS settings to use Google Public DNS in VPN(IPSec) preferences. Not the answer you're looking for? 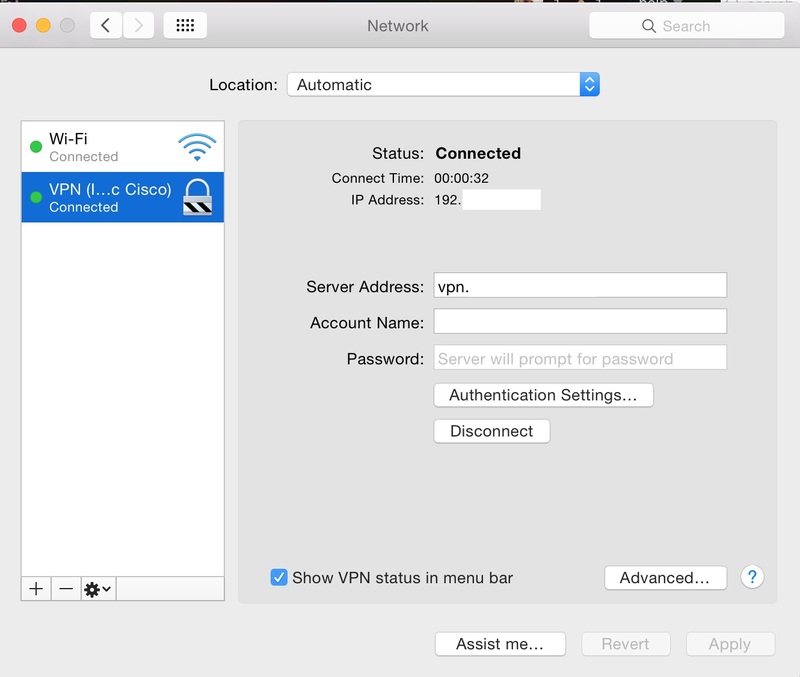 Browse other questions tagged yosemite network vpn . 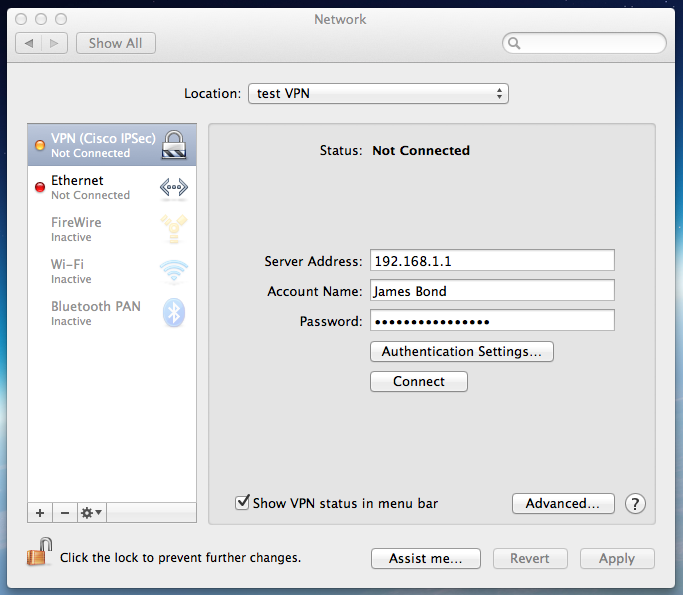 Has 10.6.7 broken the built-in Cisco IPSec VPN client? Set timeout on idle for VPN (Cisco IPsec)? 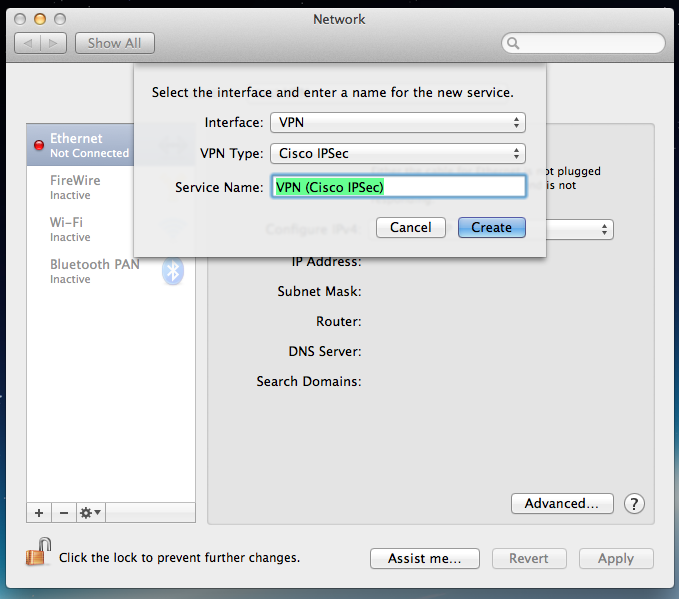 How to save password for Cisco IPSec in Mac native VPN client?